Recently, on an eldercare professionals group on LinkedIn, a post about a man in Indonesia who describes his “sundowning” received a lot of attention. If you have a loved one who is suffering from dementia, chances are you have seen this behavior. Often, as the day draws to a close, an elder with dementia will start to experience severe anxiety, or severe depression that we call “sundowning.” It may happen every day, or it may happen occasionally. These spells can be very upsetting, very disruptive: Patients may become absolutely terrified, or they may become miserably depressed. In the post that my colleagues were discussing on LinkedIn, the elderly man who was describing his symptoms painted a heart-rending picture of what it might feel like to experience sundowning. This description will help any family who’s struggling with this problem to have empathy for their elder. 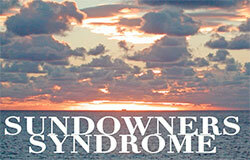 Sundowning is no picnic, not for the elder, and not for the elder’s caregivers or family. However, I think it is far more likely that someone interviewed this gentleman as he descended into his daily sundowning spell. The man does mention that he takes notes as the sundowning comes on. He writes that the next day he has no memory of taking the notes, or of what happened. I think this is important to point out. Sundowning is a form of delirium. It’s akin to the night terrors that sometimes beset children. When people are delirious, they have no idea what they are doing. When the delirium passes, they have no memory of how out of control they may have been. If you’re struggling with an elder who has a problem with sundowning, try to remember that your elder has no control over what he or she is doing. They are not trying to be difficult. They’re suffering a kind of “storm” in their brain. You just have to keep them safe, and wait until it passes. • Make sure your elder has enough sleep and adequate nutrition. • Make sure your elder has a predictable routine that that he or she is in a safe place at dusk. • Make sure that your elder isn’t over-stimulated. All elders need engaging activities during the day, but too much hustle-bustle can contribute to anxiety. • Make sure to eliminate any medical problems—pain, untreated conditions—that may be causing distress. Actually, all these measures are a good idea, whether your elder experiences sundowning or not. But if you’ve done all these things, and your elder still struggles with sundowning, remember that many medications exist that can help with the depression and the anxiety. Check out the medications section on the ElderConsult website, then discuss possible treatments with your elder’s doctor. Does your elder experience sundowning? How have you coped with it? Were practical measures enough, or did your elder need medication to relieve these symptoms? Let us know your experience here on our website www.ElderConsult.com in our Community Chat.